Growing up I definitely had my awkward moments, especially 1999-2000... the year of the glasses, braces and thick caterpillars creeping across my forehead. Makes me cringe just thinking about it. Even though perfect teeth and vision weren't in my favour growing up, one thing I was blessed with was good skin. Throughout elementary school, high school and even into university, I could put whatever crap I wanted on my face, go to sleep without washing it off and not suffer any consequences. I really didn't know how good I had it. As I get older, my skin has definitely begun to change and is no longer as forgiving. Hormones, stress, the humid summers and harsh winters have all taken a toll on my skin. Jamie, aka 'Batty', has her own story about her skin struggles. Growing up with acne, she decided to do her own research to find a solution becoming a 'self-created skin care expert'. 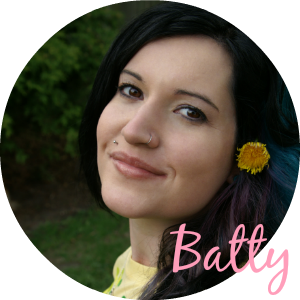 She took her thousands of hours of research and started Batty's Bath, a botanical skin care and soap company based near my stomping grounds, London, ON. Batty crafts every. single. product by hand in her two-room home laboratory, and uses fresh herbs grown with love in her very own garden and other organic and ethically sourced ingredients. All products are vegetarian friendly and certified "cruelty free" by the Leaping Bunny Program & by PETA. This girl is committed to planet-friendy, people-friendly and animal-friendly ingredients. Make sure to go check out Batty's Bath for more great products. And while you're shopping, stop by her blog, where she gives a behind the scenes look at the love that goes into her products. Sign up for her skin care videos and inspiring how-to's and you'll receive a coupon for free shipping off your first order! I love supporting small businesses as well, especially ones that have the same morals. Definitely check her out!